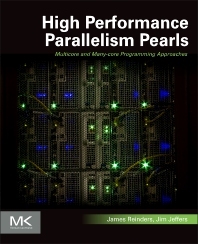 High Performance Parallelism Pearls shows how to leverage parallelism on processors and coprocessors with the same programming – illustrating the most effective ways to better tap the computational potential of systems with Intel Xeon Phi coprocessors and Intel Xeon processors or other multicore processors. The book includes examples of successful programming efforts, drawn from across industries and domains such as chemistry, engineering, and environmental science. Each chapter in this edited work includes detailed explanations of the programming techniques used, while showing high performance results on both Intel Xeon Phi coprocessors and multicore processors. Learn from dozens of new examples and case studies illustrating "success stories" demonstrating not just the features of these powerful systems, but also how to leverage parallelism across these heterogeneous systems. What can be done to improve the code? What more can be done to improve the code? What is nonoptimal about this strategy? What does all this mean to the host version? James Reinders is a senior engineer who joined Intel Corporation in 1989 and has contributed to projects including the world’s first TeraFLOP supercomputer (ASCI Red), as well as compilers and architecture work for a number of Intel processors and parallel systems. James has been a driver behind the development of Intel as a major provider of software development products, and serves as their chief software evangelist. James has published numerous articles, contributed to several books and is widely interviewed on parallelism. James has managed software development groups, customer service and consulting teams, business development and marketing teams. James is sought after to keynote on parallel programming, and is the author/co-author of three books currently in print including Structured Parallel Programming, published by Morgan Kaufmann in 2012. Jim Jeffers was the primary strategic planner and one of the first full-time employees on the program that became Intel ® MIC. He served as lead SW Engineering Manager on the program and formed and launched the SW development team. As the program evolved, he became the workloads (applications) and SW performance team manager. He has some of the deepest insight into the market, architecture and programming usages of the MIC product line. He has been a developer and development manager for embedded and high performance systems for close to 30 years.